It is also important to note that you should always speak with a professional insurance agent to discuss your particular situation and needs. Every property is different. A property in a coastal area has different insurance requirements than one surrounded by farmland. Under-insuring, an investment property, over-insuring an investment property or having the wrong types of insurance on the investment property can all produce disastrous results. Hazard and Fire Insurance for the Physical Property: Hazard and fire insurance is always needed. Liability Insurance: Liability insurance is always needed. You can purchase liability insurance for the physical property as well as for your actual business. Sewer Backup Insurance: Sewer backup insurance is always needed and can be added to your hazard and fire insurance policy at minimal cost. Flood Insurance for the Physical Property: Flood insurance is only needed if you are in a designated flood zone, if your property is located in an area that is not designated as an official flood zone, but may still have the propensity to flood, or if you are worried that a catastrophic flood could destroy your property. If your area endures a storm such as a hurricane and experiences flooding, your regular hazard and fire insurance policy will not cover your loss. 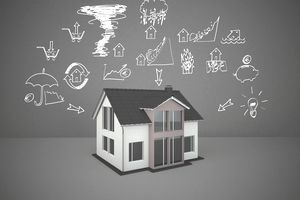 Many homeowners and property investors have unfortunately learned this the hard way when external factors, such as hurricanes, have caused flooding inside their property. Flooding caused by external water, i.e., not from a burst pipe or a leak in your home, is not normally covered by a homeowners insurance policy. Without specific flood insurance, you could be out of luck in receiving insurance money to help cover the loss. Terrorism Insurance: Terrorism insurance is only needed if you are worried that an act of terror could cause damage to your property. Builder’s Risk Insurance: Builder’s risk insurance is only needed if you purchase vacant or mostly vacant property and are renovating the property. Due to the increased risk of vandalism, property damage, and contractor injuries, properties that fall into this category will not usually qualify for normal hazard and fire insurance or liability policies. Your insurance agent will need to provide you with insurance through secondary markets. Lloyds of London is one of the largest secondary insurance providers. This type of insurance is typically two to four times more costly than normal hazard and fire insurance or liability policies. Loss of Income Insurance: Loss of income insurance is only needed if you are a landlord who owns an investment property that you are renting to tenants. Investors who flip a property with the intention of selling it to a new homeowner do not typically need this type of insurance. Loss of income insurance is usually added to your hazard and fire insurance policy at an additional cost. General Contractor Insurance: General contractor insurance is needed when you decide to become a licensed general contractor so that you can pull your own permits for renovation jobs at your rental properties. Workers Compensation Insurance: Workers compensation insurance is needed when you have employees, such as superintendents, maintenance workers, receptionists, or even when you hire contractors and allow them to work under your insurance policy. Umbrella Insurance Policy: An umbrella insurance policy is never actually needed, but it is always a good thing to have as it provides additional liability protection. This list may seem long, but it is not exhaustive. There are many additional types of insurance that you may need, which is why it is important to have a competent and trusted insurance agent on your team to review your personal situation and needs.